The 2 bathrooms are modern, well designed and are very private. Step out on to the front lawn and you will see Lake Currimundi which is 50 metres from the front door. Ducted airconditioning for cooling purposes is throughout the house. Ducted airconditioning for heating purposes is throughout the house. Miele front load washing machine with an initial starter pack of soap powder. A wall mounted clothes dryer is in the laundry. Under a protective shade sail and it is off street. Password & Log on details are in the Compendium. Formal lounge area plus a Family room area. Asko dishwasher with a starter pack of dishwasing tablets. Large fridge with a separate freezer section. Westinghouse 4 plate stove top. Some pantry items are available . Modern fully equipped designer kitchen with a dishwasher, twin sinks,large refrigerator, oven, convection microwave and modern appliances. Meals area in the Family Room can seat 4 people, the Dining Area can seat up to 6 people and the outdoor patio setting can seat up to 6 people. A wall mounted Samsung Smart T.V is in the Family room and a Samsung T.V. is in the Main Bedroom. Netflix is free for guests. A variety of reading books are on offer . A variety of board games are on offer. A variety of D.V.D's are on offer. Outdoor entertainment area wit a setting for 6 people. To put it simply NICE! Not much else needed for an easy family break, dog included. Let's start with the home, as it is just that, much more a home not a house. Very welcoming, quite, clean, convenient. Whether you or the kids great options are either on the doorstep or only minutes away. Chose your poison swimming, fishing, cycling, sup, walk, breakfast or nearby surf. Relax and unwind I say, Its all easy from Splendour. Thanks Carol for sharing your place a great friendly host who had many of those little things sorted before our arrival, again THANKS. We are thrilled to hear that all of the family and your precious fur baby thoroughly enjoyed your stay .Our guests do love the fact that our home is situated in a quiet area which is close to walking and cycling tracks, plus the fact that we are so close to the water offers guests a variety of water activities to pursue.We are sure that you will have wonderful memories to share with family and friends about your week long stay at Splendour by the Lake. Well worth a return visit! 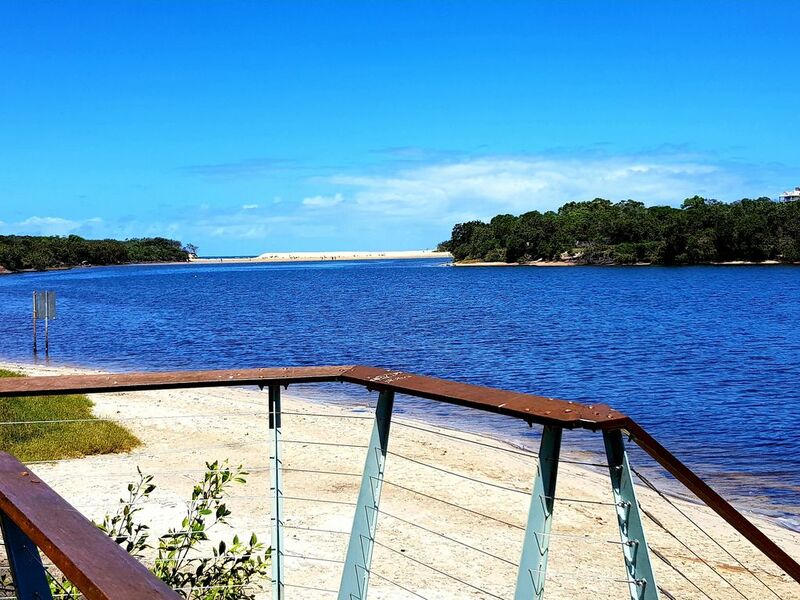 We so enjoyed staying at Splendour by the Lake this summer that we returned for another visit to Currimundi Lake and the surrounding beaches. Again, the owners were super helpful and the accommodation very clean and comfortable. We're already looking forward to our next stay. We are delighted to hear that you thoroughly enjoyed your return visit to Splendour by the Lake and that the house with its close location to the water,cycling and walking tracks restaurants and shopping centres was appreciated. Looking forward to welcoming you back on your next visit to the Sunshine Coast. Pleasant house in a great location! Splendour by the Lake is a comfortable, well-kept house in a great location near Caloundra on the Sunshine Coast, and the owners couldn't have been nicer to deal with! It is lovely to hear that you had an enjoyable and relaxing holiday and that the house with its close proximity to the water, walking tracks, restaurants and shops catered for all of your needs.We look forward seeing you on your next visit to the Sunshine Coast. We really enjoyed Splendour by the Lake. The house is comfortable and well-kept, and close to beaches, parks, and shops. The owners were accommodating and very pleasant to deal with. All in all - a great place to stay on the Sunshine Coast! We are thrilled to hear that you thoroughly enjoyed your stay at Splendour by the Lake and we are sure that you will have many fond memories that you can share with family and friends when you return to Canada. We thoroughly enjoyed our stay at Splendour by the Lake. The kids and the fur baby had a ball playing at the lake, which took less than 1 minute to walk to! The house and amenities are first class and Carol and Ian's knowledge of the area and hospitality was fantastic! We had an amazing time and will definitely be back! We loved having the opportunity to share our ‘Piece of Paradise’ with you and your lovely family and it gives us a great deal of pleasure knowing that all of you , including your precious fur baby had a fabulous stay at Splendour by the Lake.We look forward to welcoming you back on your next visit to the Sunshine Coast. Loved the location as it was convenient to beaches, restaurants and shops. We were able to take our bikes and ride along the fabulous bike track along the water and National Park, which starts at the back gate! The house was very clean and well presented. The hosts were very welcoming and helpful. We are looking forward to our next stay here. Wow...we are delighted to hear that you and your family had a fantastic holiday at Splendour by the Lake.The close proximity to the lake, beaches, cycle,walking tracks,shops and restaurants are always a highlight with our guests and we look forward to welcoming you back in the near future.